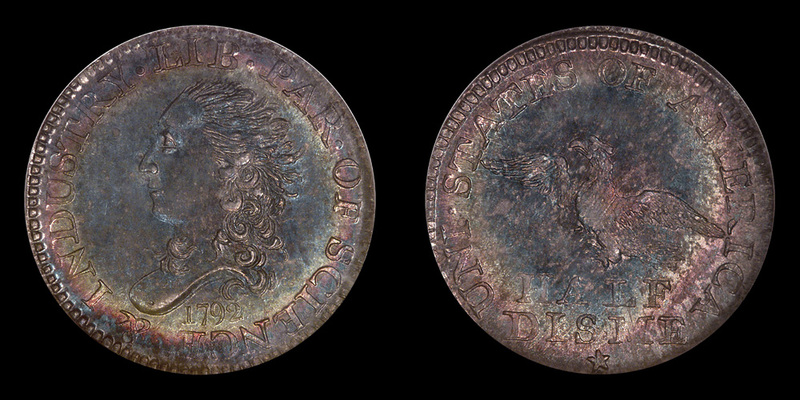 During the first two days of the Long Beach Coin, Stamp & Collectibles Expo on February 3 and 4, 2011, Stacks-Bowers Numismatics will display the finest known 1792 half disme, graded NGC MS-68. The classic early American rarity was acquired in 2007 by the Cardinal Collection Education Foundation of Sunnyvale, California for $1.5 million. “This is an early American numismatic treasure. All of us at Stack’s-Bowers are delighted to showcase this coin for thousands of collectors and dealers to see in person at the upcoming Long Beach Expo,” said Chris Napolitano, President of Stack’s-Bowers Numismatics. The coin will be displayed at their booth 502 in the Long Beach Convention Center, 100 S. Pine Ave, Long Beach, California. The half dismes were the first coins authorized by President Washington under the Mint Act of 1792. The obverse depicts the portrait of a symbolic female representation of Liberty, the legend, LIB. (liberty) PAR. (parent) OF SCIENCE & INDUSTRY, and the year, 1792. The reverse has the denomination, HALF DISME, and the words, UNI (united) STATES OF AMERICA surrounding an eagle. “This extraordinary coin was struck in the basement of a Philadelphia saw-maker’s shop in July 1792 when the Mint was not yet operational, but it is considered the very first circulating issue of the United States Mint,” explained Martin Logies, a director and curator of the Cardinal Collection Educational Foundation that supports research and publications about early American money. Two days later, July 13, 1792, Jefferson picked up the newly-struck coins that Washington had authorized four days earlier on July 9. Less than 400 surviving examples are known today from the 1,500 recorded struck. The 1792 half disme is ranked number 12 in the book, 100 Greatest U.S. Coins, by Jeff Garrett and Ron Guth. Over the centuries the untouched silver surface of this coin has toned to deep blue with touches of purple and light red, apparently from storage for years in a Wayte Raymond cardboard album in the mid 20th century. Because of its exceptionally sharp details and immaculately preserved condition, Logies and research colleague, Karl Moulton, believe this particular coin was part of a group originally owned by the first United States Mint Director, David Rittenhouse. “A small number of high-grade specimens were passed down through the Rittenhouse family for generations, and finally were dispersed very early in the 1900’s. This particular one, the finest of that group, was retained by the family for an additional period, until it was consigned to the 1919 official ANA convention auction, conducted by Henry Chapman,” Logies said. Cardinal Collection Educational Foundation, 2007 to date. a really nice 1792 half dime!great for collectors!